Twenty years ago, Frances Mayes--widely published poet, gourmet cook, and travel writer--introduced readers to a wondrous new world when she bought and restored an abandoned villa called Bramasole in the spectacular Tuscan countryside. Under the Tuscan inspired generations to embark on their own journeys--whether that be flying to a foreign country in search of themselves, savoring one of the book's dozens of delicious seasonal recipes, or simply being transported by Mayes's signature evocative, sensory language. 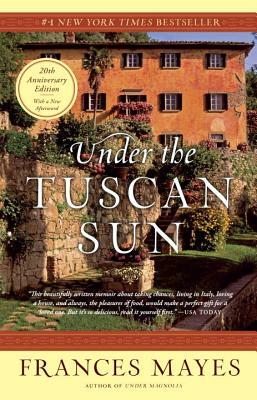 Now, with a new afterword from the Bard of Tuscany herself, the 20th anniversary edition of Under the Tuscan Sun brings us up-to-date with the book's most beloved characters. FRANCES MAYES is the author of a series of Tuscany memoirs, including Every Day in Tuscany and Bella Tuscany; the travel memoir A Year in the World; the illustrated books In Tuscany and Bringing Tuscany Home; Swan, a novel; The Discovery of Poetry, a text for readers; five books of poetry; and most recently a southern memoir, Under Magnolia. She divides her time between homes in Italy and North Carolina. "This beautifully written memoir about taking chances, living in Italy. loving a house and, always, the pleasures of food, would make a perfect gift for a loved one. But it's so delicious, read it first yourself." "Irresistible...a sensous book for a sensous countryside." "Armchair travel at its most enticing." "After buying a rundown villa in rural Tuscany, the American author Frances Mayes moves to Cortona to renovate the property and learn more about the Italian dolce vita. Her bestselling memoir on her time there paints a vivid description of the town, the people and the lush surrounding countryside of rolling hills and vineyards. A poet and a gourmet cook, Mayes includes a number of chapters on food, replete with classic Italian recipes to further whet the appetite."